Learning how electrical circuits power everyday objects. Students practicing their spatial awareness skills using osmo tangrams and manipulatives. The Mustang Makerspace opened its doors in February 2017 as a creative lab for Arroyo students to design, invent, create and imagine through the use of technology and everyday items. The Makerspace came together through technology grants, PTA funding, and generous donations from Arroyo families. Students have the opportunity to work through the scientific design process and complete engaging, hands-on challenges that align with CA NGSS (The California Next Generation Science Standards). 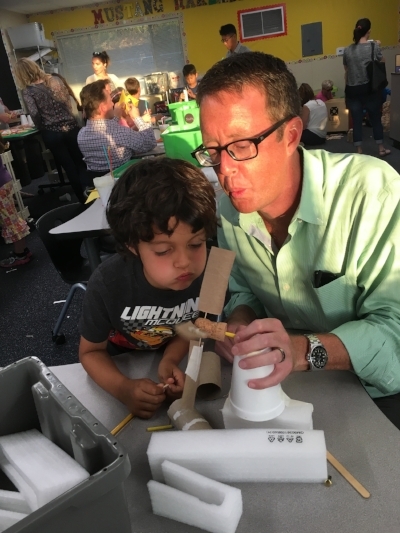 As of the 2017-2018 school year, Arroyo now has its own part-time Makerspace paraeducator to support students and staff with all things STEAM (Science, Technology, Engineering, Arts, Math), thanks to PTA fundraising! and almost anything else that can be deconstructed, upcycled and repurposed! coding dash and dot robots in our 21st century makerspace! can you build a bridge using popsicle sticks and tape that will hold the weight of all these toy cars? every builder and maker can come up with their own unique designs using lego bricks. design and build challenges using keva planks. we are future architects and engineers!